There are a lot of myths and misperceptions about what a patina is, how it is done and what it all that means to the bronze sculpture collector. So if you have a minute, get comfortable and get ready for a little education. 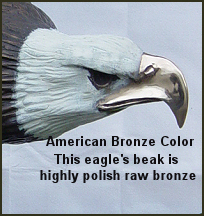 There is a widely held belief that the natural color of bronze is brown. 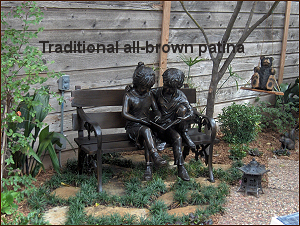 While it is true that many bronze sculptures you may have seen have been given a brown patina, the natural color of quality made bronze is actually gold. In fact, I have a bronze ingot bar on my desk and I am often asked if it is a gold bar. It weighs about 10 pounds and gold currently sells for around $1,500 an ounce, so since a gold bar like this would sell for $240,000, my first reply is "I wish." 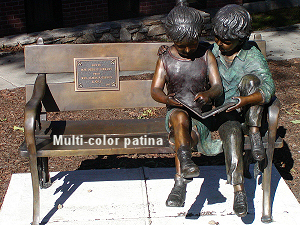 A patina is the outside color of bronze. It is the result of a chemical reaction with the copper in the bronze that literally changes the surface color of the bronze and it can be either natural, man-made or both. 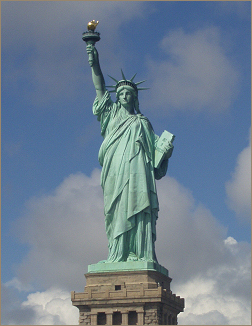 A great example of a natural patina can be seen on the Statue of Liberty. The beautiful green color is the result of decades of air and moisture reacting with the copper in the bronze. Although a natural patina can have streaks and spots, it is highly coveted by antique bronze collectors because is it gives a sculpture is character and takes many years to fully develop. However, a natural patina usually develops over a man-made patina that was applied by the artist during the casting process. To truly understand the process of applying the patina to a sculpture you need to go back to the raw bronze material that was used to cast the sculpture in the first place. Bronze metal is not a naturally occurring metal in and of itself, but rather an alloy of copper, meaning copper mixed with other metals. A quality bronze will have a copper content of at least 90% and it is precisely the high copper content that make patination possible. To apply a patina an artist reheats the bronze sculpture using a roofer's torch or to a temperature over 200 degrees Fahrenheit. Chemicals are then applied with a brush or spray bottle. Once the desired color is achieved the sculpture is rinsed with cold water to stop the chemical reaction. 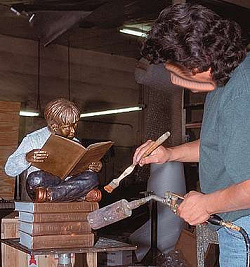 Once the desired color is achieved two coats of wax are applied to the sculpture while it is still warm to seal the patina. 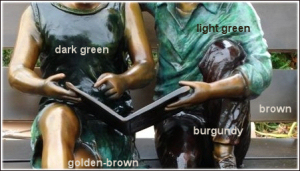 Different chemicals react with the bronze to achieve different colors. One of the most common patinas is Liver of Sulfur (potash) which results in a golden-brown to almost black color. Other chemicals include Ferric Nitrate (golds, browns and reds) and Cupric Nitrate (greens and blues). They can also be used in layers to achieve a variety of artistic effects. While most patinas are applied hot, patinas can also be applied cold. Cold patinas are used most frequently to make repairs. Historically, Liver of Sulfur has been the patina of choice for most sculpture for the rich chocolate brown color most people are familiar with. In the late 1800's and early 1900's the French sculptor August Rodin began experimenting with different chemicals that would result in different colors. 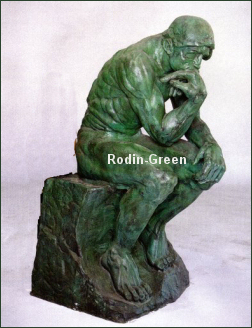 Rodin would layer green patina over a base coat of brown to achieve a marbleized effect that became known and Rodin green. In later years metallurgists found many other chemicals that would result in a variety of colors. Today, while multicolored patinas are quite popular, most private commission sculpture is still done using more traditional browns. 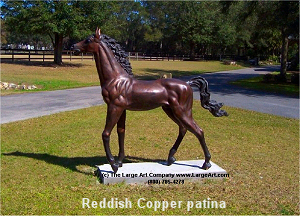 At The Large Art Company we offer a full range of patina colors. 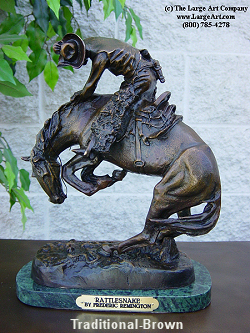 While most sculptures have a standard color, almost any piece can be customized. Below you will find a few pictures of different sculptures done with a variety of patinas.